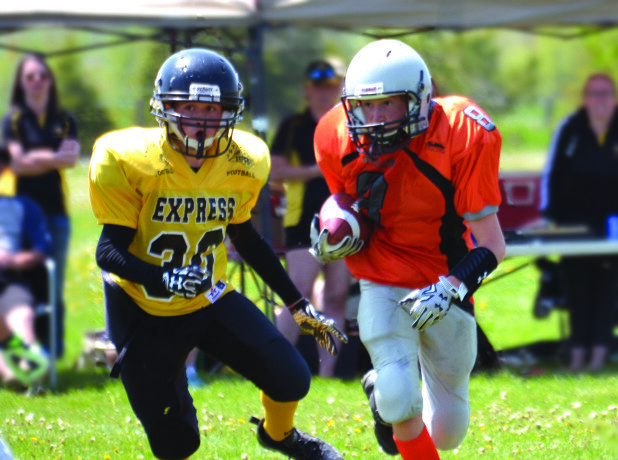 After having tough time last year, the Orangeville Outlaws Bantam team blasted out of the starting gate in the first game of the season delivering a 65-18 win over the TNT Express in Beeton on Sunday, May 22. The Orangeville team didn’t just win, they played a solid well executed game that saw them dominate for all four quarters. The Outlaws opened the scoring early in the first quarter with a touchdown from Brendon Barrow and a follow up conversion from Nathan Falconi. The Express fought back scoring a first quarter touchdown. Barrow got his second of the game early in the second quarter on a sprint down the sidelines. The third O-ville TD came on a strong run to the left by Derek DeLangley to put the Outlaws ahead by 20 points. Starting in the second half, the Outlaws held their ground with Aiden Murray breaking through the line for a quarterback sack early in the second half. The TNT team stepped their game up in the second half and scored twice but the Outlaws kept up the pressure for the remainder of the game. The Orangeville squad wrapped up the half with touchdowns from Barrow, Murray, and Nathan Falconi. The final was 65-18 for the Outlaws. The game was a marked improvement over last season which saw the Bantam division struggling for the entire season. The O-ville Bantams will have a couple of weeks off to rest up and get some practice in before hosting their home opener at Westside Secondary School in Orangeville. They will meet up with the Toronto Jets in that game. The kick-off is scheduled for 1:00 p.m.